•The Board approved a plan to designate Metro’s rail and bus rapid transit lines with colors and letters in the future. 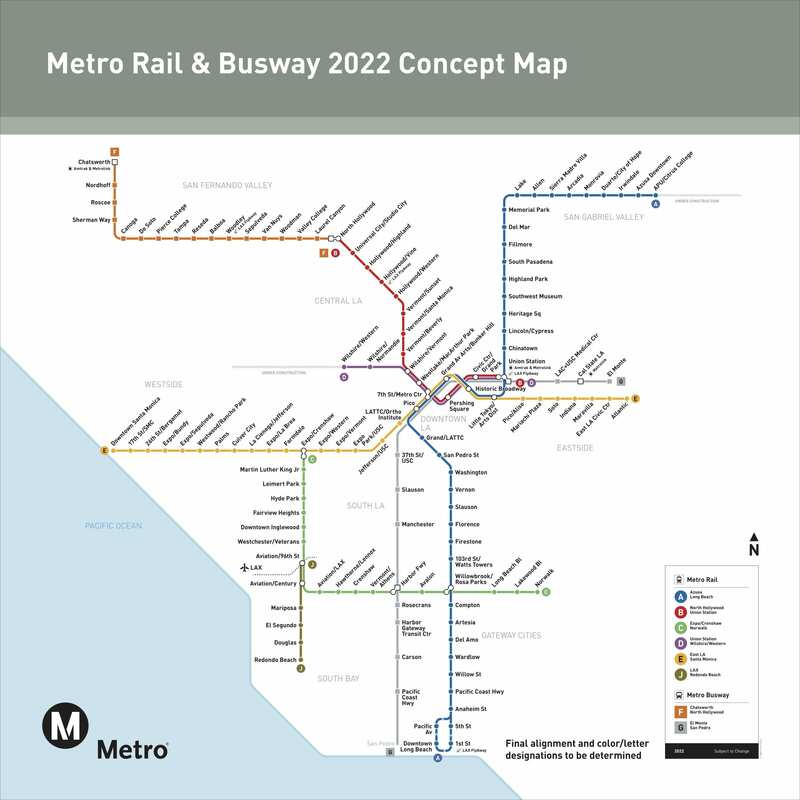 The new names will be phased in beginning with the Blue Line (which will be the A Line) and Crenshaw/LAX Line (C Line). Staff report and Source post. •The Board approved proposed updates to the Artesia-to-downtown Los Angeles light rail project, aka the West Santa Ana Transit Corridor. Source post. The Board also approved a motion to add an optional station for study at the confluence of the L.A. River and the Rio Hondo in South Gate. •On a 7 to 4 vote with two abstentions, the Board approved a motion approving the C-3 operating plan for the Crenshaw/LAX Line and Green Line to be put in place after the Crenshaw/LAX Line opens, which is forecast for mid-2020. The operating plan would be a one-year test program. Staff report and Source post. A vote on the Metro staff-recommended C-1 plan was not taken due to the passage of C-3. Both plans are below. 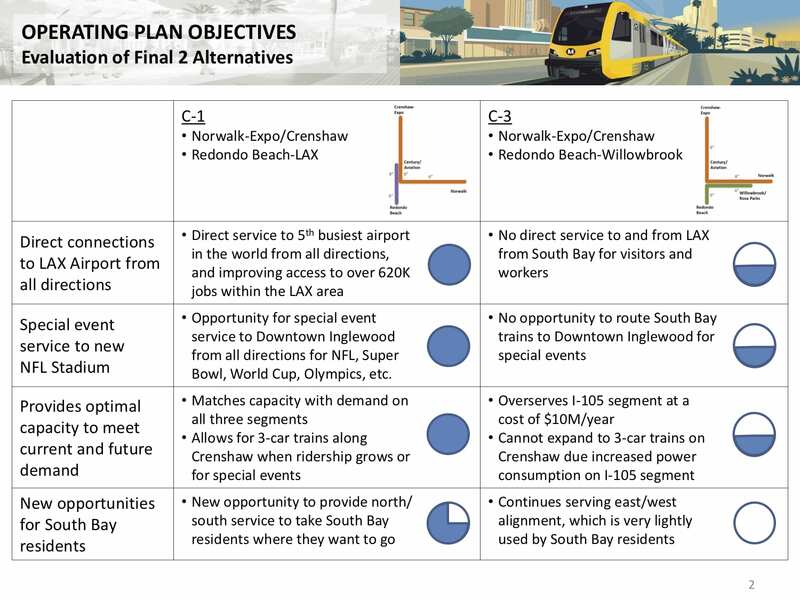 This was a long discussion with staff saying the C-1 plan would ultimately serve more riders, allow more direct trains to LAX and special service to the new football stadium in Inglewood. Staff also said that the C-3 plan could potentially interfere with running three-car trains on the Crenshaw/LAX Line due to power constraints on the Green Line, which opened in 1995. Supporters of the C-3 plan argued that it would allow continuation of direct service between the South Bay and Willowbrook/Rosa Parks Station and would not impair service on the Crenshaw/LAX Line. Conversely C-3 supporters pointed out that the C-1 plan would have required riders heading east on the Green Line to transfer at the new Century/Aviation Station — which would add seven minutes to rides. •The Board heard a recieve-and-file update on the development of a financial plan for the Twenty-Eight by ’28 Initiative to build 28 major projects in time for the 2028 Summer Olympics and Paralympics. Metro CEO Phil Washington went through the presentation below (pdf here) that looked at potential ways to raise the $26 billion needed to accelerate eight of the 28 projects. The other 20 projects are already scheduled to be completed by 2028. Among revenue sources discussed: imposing fees on ride hailing vehicles (Uber and Lyft, etc.) and congestion pricing, which Washington pointed out could help ease traffic, improve air quality and raise enough money to add capacity to transit and eliminate fares to ride transit. To stress: this was only a update and and the Board was not asked to take any action today — although both are in Metro’s 2028 Vision Plan. Curbed LA did post about the discussion. The Board will consider a financing plan and potential funding strategies in early 2019. It’s also worth noting that Washington stressed that increasing agency debt came with risks to the agency’s future finances and that funds for programs such as State of Good Repair should be off limits. Board Chair Kuehl had some interesting comments on all this, saying she doesn’t see a rush to complete 28 projects and that she wanted her colleagues to consider that a good way to serve Metro riders would be to keep the agency on a strong financial foundation. •The Board approved a Board motion that would reaffirm Metro’s commitment to build the Gold Line to Claremont. Source post. The Foothill Gold Line Construction Authority announced earlier this fall that the Gold Line extension from Azusa would be built in two phases due to rising construction costs. The first phase would run to La Verne and the second phase — if $570 million can be secured — would run to Claremont and Montclair. •The Board approved a list of projects and $550 million in funding to improve traffic and mobility in the area near the 710 freeway gap between Alhambra and Pasadena. There was considerable public testimony both in support and against the project list — supporters said these projects were long overdue, those against said projects would increase car traffic and go against the grain of fighting climate change. Metro staff said the projects did not involve street widening and some streets may be able to accommodate bike lanes. Board Member Hilda Solis asked staff to include active transportation projects in future funding cycles for this project. Has there ever been any look at adding a brach to the Silver Line that would use the LA LA Land Express Lane HOV ramps to go from Interstate 110 to Interstate 105 and could stop at the current Aviation/LAX stop or even the other South Bay Green Line stations so as to provide a one-seat ride from the South Bay to DTLA? Given that the Green Line was originally going to be a busway, it would be a bit of back to the future. The other issue here is that the Green Line was meant to be automated and meant to therefore operate at higher frequencies. Need to update that map to reflect C-3. I guess Crenshaw would be J and the existing Green Line Redondo Beach-Harbor I-105 would be C? $550 Million dollars to widen roads in the SGV and Metro can’t find a dime to paint a bus lane on Atlantic Blvd. This is why climate change is not going to be stopped. That’s more a matter of politics than money. Metro has no jurisdiction over bus lanes, it is up to the cities themselves to create bus lanes. The cancellation of the 710 Fwy should go to projects to alleviate traffic congestion, not fighting climate change and mass transit. I was hoping the 710 Fwy connection would finally be completed by the end of this decade. This is just bad news. So the consolation prize should be fixing the horrible traffic surrounding the 710 stub off-ramp. The traffic around Monterey Park, Alhambra, South Pasadena, and Pasadena are the worst. They need to widen the roads. They are already suffering road diets for the past 5 decades. At least widen the 110 Fwy as a detour and fix the connection towards the 210 Fwy. If Metro wishes to install a light rail line on Atlantic from the Gold Line towards La Canada Flintridge, it would be an excellent idea. South Pasadena will be as against that as the 710. Back in the day there were 4 rail companies that operated in SP. And PE had 4 sets of tracks running up Huntington Dr. to Fair Oaks and 2 up Fair Oaks. SP is no stranger to public transit.